Global temperatures for September 2018 were 0.61C based on merging GHCNV3 with HadSST3 and using spherical triangulation. This is a fall of 0.08C since August. The baseline for temperature anomalies is always 1961-1990. Monthly temperature anomalies updated for September 2018. The annual average so far (9 months) for 2018 is 0.65C , making it on track to be the 4th warmest year. The spatial distribution shows a cold eastern Canada and a cooler Antarctica. This entry was posted in AGW, Climate Change and tagged Climate Change. Bookmark the permalink. Giving an end of century anomaly of 1.2°C. provided none of the oft predicted multi decadel minimums arrive, in which case it might not even get to 1°C. If temperatures rise linearly. In fact they are predicted to rise logarithmically with CO2. So it may rise less if emissions can be stabilised. Such a logarithmic rise is assuming that mean temp anomaly is almost exclusively caused by CO2, with is a very unlikely supposition. Also upto now emissions have been rising exponentially with more or less comes back to linear … if we keep finding an exponentially increasing amount of fossil fuels to burn. It seems unlikely that AGW accounts for more than half of the simplistic linear “trend”. The rest is likely natural variability. in fact CO2 emissions have been rising roughly exponentially so that brings the log back to linear … if we continue to find exponentially rising quantities of fossil fuels to extract. So that would theoretically add a roughly linear rise unless climate feedbacks compensate in some way for this “forcing”. The great delusion is that this does NOT mean that any fitted linear function to temperature can be attributed to AGW. There are and always have been natural variations which can also be fitted to a linear function. This is so trivial a correlation that you can do it to any data. There is absolutely no grounds for attribution. That is the great global warming con. 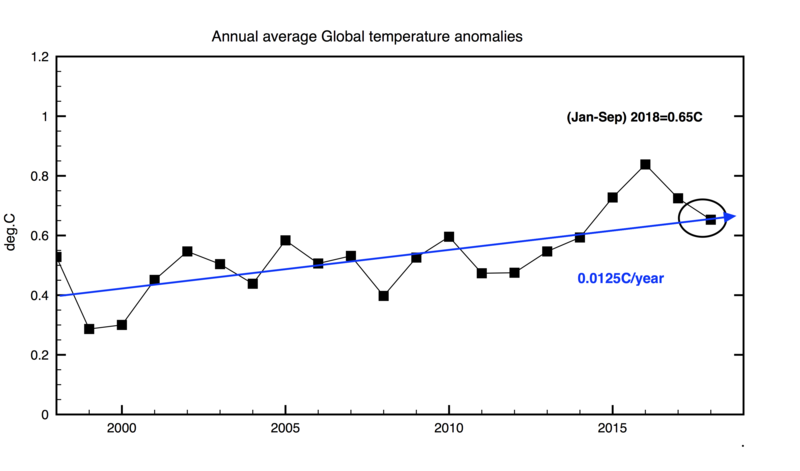 In your first graph a dip in temperatures at year 2000 but not in 2009 ? Comparing the lower trop to the surface one might wonder what the expected correction coefficient is between the two. For a couple of years this seemed a mystery subject that I could not find an answer for. Then I found this CA post from 2009 where Gavin Schmidt and Richard Lindzen supposedly had agreed that the lower trop should be 1.4X more responsive to radiative imbalance than the surface. Then in the discussion right when Robert Way was about to quantify the conflict between RSS-UAH and Hadcrut Gavin popped in to disavow the 1.4X (which I suppose was the origin of the infamous “tropospheric hotspot” that never materialized.) Gavin gave a rationale for a 0.95X over land and everyone shrugged and accepted. Bizarre science. From Hadcrut3 to Hadcrut4 there was a cull of South American stations, while hundreds of new ones were added in Arctic regions – Siberia etc. So there has been a small increase in trends due to this. The most dramatic change was in CRUTEM3 to CRUTEM4 but this was mainly due to a change in the way they calculated the global average. CRUTEM3 used (NH+SH)/2 while CRUTEM4 used (2NH+SH)/3 ! Thanks Clive, I was not aware of that. ( Not that I take CRUTEM seriously enough to bother looking anyway ). So presumably they are using an area weighted gridded average to derive each hemisphere , This should be applied globally. The division into NH/SH is totally irrelevant. I think the reason they do it is because coverage is so sparse in the southern hemisphere, especially in the early years. So they weight the SH as a simple proportion. Originally they used 1:1 but then realised that the SH is mostly ocean so moved to a simple 2:1 factor. Interesting that the graph shows +.025*C since 1998, so there was no ‘pause’ at all as global temperature is still continuing to rise over that period. The pause is all in the eye of the beholder. If you look at the top graph curtailed at the end of 2014 then you can claim that there was a pause. Meanwhile each new version of Hadcrut4 makes slight corrections (new stations and corrections) as well. Or you can take 2008 thru 2014 in that top graph you mention and see that the global ss temp rose through those 7 years, so no ‘pause’ there. 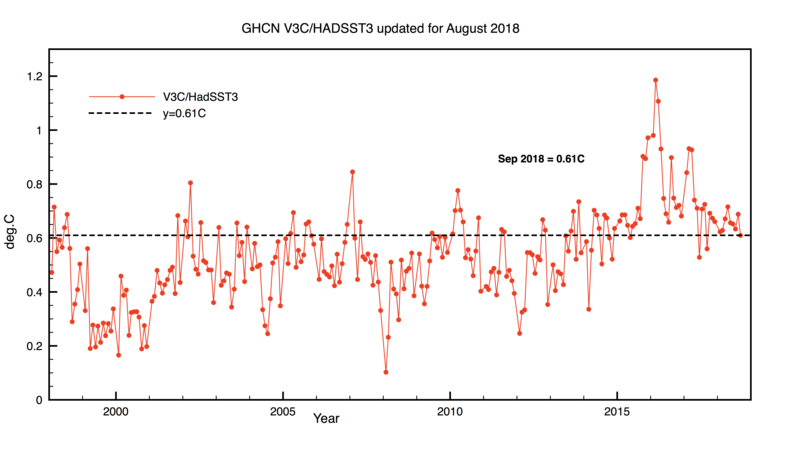 That GHCN VC3/HADSST3 graph also shows ss global temps have risen +.4*C in just the most recent 11 years from 2008 – 2018. It is true, you can see whatever you bent is inclined to see , if you want to. However, your graph starts with a few years of Nina trough and ends with the long El Nino peak. Those natural variations were roughly equal and opposite and that leaves that whole period essentially flat, if you are looking for longer term variations. It is interesting that now the last remains of the sustained El Nino are fading away the temp is back down to the average of the whole period. There does not seem to be any residual warming as there was after 1998 event. That’s because the residual warming after the 1998 event was likely due to CO2. This “sustained El Nino” hypothesis remains conjecture. OHC continues to rise. Except of course if your bent takes out from said graph the years 2015 and beyond, the ‘flat’ line would then read approximately .02*C lower, so adding 2015 and beyond raises the temp line and does not leave it ‘essentially flat’. Also, this is 2018 iirc. How does the graph also include 3/4ths of the year 2019? Almost exactly the same values as well ! This is excellent work. Thanks to both you and Nick for providing this. I’m not sure of the value of trend. As always it depends on where you start and finish and what you are going to imply from fitting a linear model. The inevitable thing that happens when you fit a linear trend is that everyone extrapolates it to work out “what will happen by 2100” which is totally baseless. Any extrapolation that far outside the sample period is unscientific. I was curious why you chose this limited period of the record to fit a trend. It starts with an multi-year dip and ends with a multi-year hump. That is probably not representative of longer term climate trends. What is the reason for the short range ?